The rural mailbox is a study in contrasts. On the one hand, it’s a personal postal sanctuary fiercely protected by the federal government. 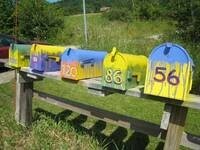 On the other, provided the “current resident” owns it, a mailbox can also be a means of self-expression. Along Vermont roadsides, it’s not unusual to see Audubon scenes, American flags and Warren Kimble creations mingling with the standard black, slushy silver, or rusty-red metal loafs. O’Brien and her husband Joe live with two cats on a beautiful wedge of land at the corner of Mayo Road and the busy route between Richmond and Huntington. Former flight attendants who met on the job in Chicago, they built their own house — it’ll be 2 years old this fall — and co-own Film Buzz, Richmond’s premier video store. The shop’s mosaic countertop is one of Kelly’s art “projects.” Dozens of others — a whimsical tricycle totem, rusty sculptures, handmade bird boxes, self-portraits in oil — spill out of the house onto the wrap-around porch and into the yard. About a dozen people responded, and O’Brien went to work — on location. Before she starts to paint, she takes a picture of the mailbox with her cellphone — in case it has to be restored to its original condition — then cleans it, sands it, and peels off any stickers. The whole process usually takes a couple of hours. They also tell her what they want to be called, O’Brien asserts. In the last month, she’s started signing her works and giving them descriptive names like “Fern Splatter” and “Drip Quints.” The former, surrounded by lush vegetation on Taft Road, is sky-blue, drizzled Jackson Pollock-style with green and yellow paint. The latter is a bank of five boxes, each with a different drippy color combination. O’Brien isn’t aiming to make money from her mailbox art. But the experience has helped her better understand how she works. An art class at CCV helped, too. The product of a Kansas City cop and a “creative and crazy” mother, O’Brien is a self-described “people pleaser” who admits she dislikes authority. The contradictory qualities of a mailbox — it’s private and public, restricted and personalized — seem ideally suited to her unique psychology.